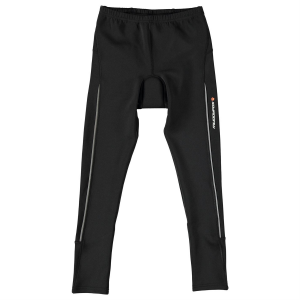 Your youngster will be comfortable, no matter how rough the terrain, in these Muddyfox Padded Cycling Tights, designed as a full-length style with an elastic waistband, an internal drawstring, a highly padded seat, and reflective elements for safety.. . Full length . Elastic waistband. Internal drawstring. Highly padded seat . Reflective elements . 93% Polyester, 7% Elastane. Imported.